The Bash completion script I use is from http://bash-completion.alioth.debian.org. I found that there is an existing bug for this issue #467231: bash_completion is big and loads slowly; load-by-need proposed and someone has submitted a script to speed up Bash completion load time called dyncomp.sh. This is a one-time script, which only needs to be run when you install your Bash completions or modify them. It loads your completions and moves the completion functions out of the script and into a separate directory. They are only loaded when needed. This speeds up the load time considerably and new terminal windows open up instantly! You can visit my GitHub dotfiles repository for the latest version of my Bash profile. 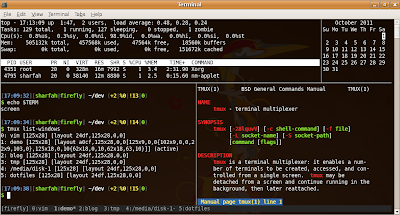 OpenSSH allows you to speed up multiple SSH connections to the same server using "multiplexing". The first connection acts as the "master" and any other connections reuse the master instance's network connection rather than initiating new ones. ControlMaster auto will use a master if one exists, or start a master otherwise. ControlPath is the path to the control socket used for connection sharing. %r, %h and %p are replaced with your username, host to which you are connecting and the port respectively. In addition, you may want to add Ciphers arcfour in order to use the arcfour cipher which is faster than the default (aes128-cbc). The transfer rate of arcfour is about 90 MB/s, aes128-cbc is about 75 MB/s and the slowest is 3des-cbc, at 19 MB/s. The "Try With Resources", also called "Automatic Resource Management" (ARM), statement allows you to declare one or more resources in the try statement. When the statement completes, either successfully or unsuccessfully, all of its resources are closed automatically. You don't need to manually close resources in a finally block anymore, which means you don't have to worry about resource leaks. Here is a method to make a copy of a file, using the Try-With-Resources statement. There are two resources defined in the try statement, which are automatically closed when the statement completes. }//no need to close resources in a "finally"
Previously, rethrowing an exception was treated as throwing the type of the catch parameter. For example, let's say that your try block could throw a ParseException or an IOException. To intercept all exceptions and rethrow them, you would have to catch Exception and declare your method as throwing an Exception. This is "imprecise rethrow", because you are throwing a general Exception type (instead of specific ones) and statements calling your method need to catch this general Exception. This leads to improved checking for rethrown exceptions. You can be more precise about the exceptions being thrown from the method and you can handle them a lot better at the calling site. This because the compiler tries to create an array of Pair<Integer,String> to hold the varargs, which is not permitted because Pair<Integer,String> is type erased at runtime to just Pair. (More information here.) To suppress this warning, you need to add @SuppressWarnings("unchecked") to each method which makes a call to the varargs method. In JDK7, the warning has been moved from the call site to the varargs method declaration and you can annotate the varargs method with @SafeVarargs in order to suppress it. This reduces the total number of warnings reported and those that have to be suppressed. Quick fix gives you the option to Add @SafeVarargs to your method. Strings in switch gives you the ability to switch on string values just like you can currently do on primitives. Previously, you would have had to create chained if-else tests for string equality or introduce an enum, which is not necessary anymore. The strings-in-switch feature works by first switching on the hashCode of the String and then performing an equals test. You can now catch more than one exception in a single catch clause which removes redundant code. //in jdk7, use the diamond operator. Saves typing! The compiler infers the type on the right side. So if you have a list of ?, the compiler will infer a list of Object. Eclipse Content Assist (Ctrl + Space), auto-completes using a diamond instead of explicit type arguments. So, in the example above, when you type new HashM[Ctrl+Space], Eclipse will insert new HashMap<>();. You can also configure Eclipse to warn you if you use explicit type arguments, instead of a diamond. To do this, go to your Preferences and navigate to Java > Compiler > Errors/Warnings. In the Generic types section, select Warning against Redundant type arguments. Eclipse will then offer you a quick-fix to remove the type arguments, if you accidently put them in.